We believe that Shangri-La Asia’s (69 HK, “Shangri-La”) recent share price weakness has been due to worries over trade war uncertainties and RMB weakness. China remains an important market for the company with Shangri-La’s mainland Chinese hotel assets contributing 49% of the group’s hotel EBITDA and 31% of the group’s EBITDA across all segments in FY17. We do note signs of weakening RevPAR growth and have lowered both our RevPAR expectations. According to Smith Travel Research, China’s Jul, Aug and Sep 2018 RevPAR growth came to +0.7%, +1.7%, and -3.2% YoY respectively (USD terms). In contrast, recall that Shangri-La’s RevPAR grew by 12% YoY in 1H18. Shangri-La expects to recognize profits from the sale of residences in its Colombo development in the second half. As of Jul, ~72% of the development’s GFA had been sold and the group expected to hand over at least 50% of the sold units before the end of 2018. Should they have realized their mid-year expectations, the group should record a net share of profit of US$60m in 2H18 (v. US$11.9m in 1H18). In our initiation report published earlier in 2018, we viewed Shangri-La as a proxy to a multi-year recovery in the mainland Chinese luxury hotel industry. While we believe the supply situation will be more manageable compared to the historical pace of increase, we are now less certain of the strength of demand with the ongoing macroeconomic uncertainties. That said, current stock price levels remain attractive to us even after taking into account the moderated growth prospects. In line with our updated RevPAR expectations as well as an updated target EV/EBITDA, our SOTP fair value drops from HK$20.00 to HK$16.40. 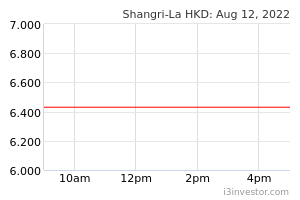 Shangri-La is currently trading at a 0.77x fwd P/B. Interestingly, the stock jumped +10.3% on 28 Dec and +5.5% on 31 Dec 2018 on unusually high volumes, and a possibility is that institutional investors have started to notice value in the counter. Do take note that ShangriLa remains a highly volatile counter. Maintain BUY.